Carnival Freedom sails into Venice, Italy. One of six Conquest sisters, the bright and playful 110,000-ton 2,974-passenger Carnival Freedom is themed on time travel, its public rooms decorated to resemble everything from ancient Babylon to the 19th-century Victorian era and 70s disco days. 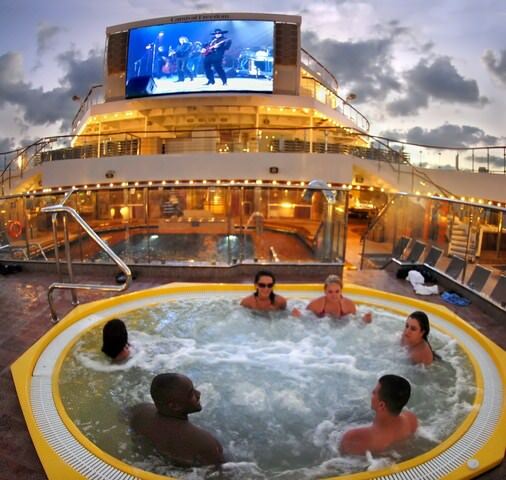 Passengers relax in one of Carnival Freedom's Lido Deck hot tubs and take in the entertainment on the big screen. Photo courtesy of Carnival. The glittery nine-deck-high atrium is anchored with a bar and is a great place to meet or people watch. In all, there are 22 bars and lounges, from a sports bar with 1950s memorabilia to the 1940s-style Habana Cigar Bar with barstools and tabletops that look like stogies. There’s the Studio 70 dance club with black walls and disco balls hanging from the ceiling, plus a piano bar and a jazz club designed with a classic 1930s look. The casino packs in almost 300 slot machines and about two dozen gaming tables. The three-level theater is the venue for pull-out-the-stops Vegas-style song and dance productions accompanied by live orchestras. 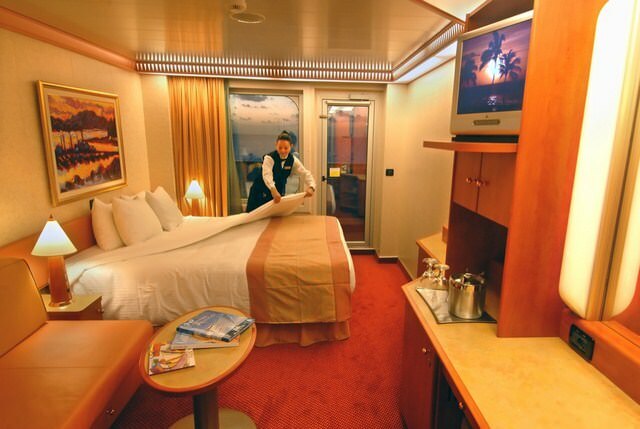 One of the comfortable Balcony Staterooms aboard Carnival Freedom. Photo courtesy of Carnival. Dining options include a pair of two-story main restaurants as well as an intimate, extra-cost steakhouse serving USDA prime aged steaks and seafood for a mostly adult clientele looking for a more upscale experience. Meals are also served in the two-story lido buffet (featuring a replica of the Statue of Liberty) where you’ll find separate stations for Asian and American dishes, deli sandwiches, salads, pizza, burgers and more. The four swimming pools include the main pool flanked by a pair of huge hot tubs, a stage for live (and really loud) music, and a giant movie screen for videos and ship events. A 3-deck-high twisting water slide takes thrill-seekers on a 214-foot-long ride. As big on cabins as it is on fun, Freedom offers standard outsides that measure a roomy 185 to 220 square feet. The amenities include stocked, pay-as-you-go minifridges, robes to use, and super comfy mattresses and bedding. Does the thermal suite in the spa have the stone or tile warm beds or loungers? I can’t seem to find any info on this? In May of 2014 I took a cruise on the Carnival Freedom. It was not only my first cruise, but my first time leaving the country as well. For months we saved so we could spend our Anniversary doing many new things. We did a lot of research before deciding on Carnival. We wanted to make sure that we knew about all the extra costs that comes with taking any cruise. So we read and studied; we anticipated fees, tips, tax, and add-ons. We were certain we were prepared for every curveball. Except, we hadn’t anticipated a well-known company to have such shoddy customer service. For the majority of the cruise most of the spas and some of the other water “features” were closed. There was a section of the ship completely closed for “remodeling”. The “theatrical productions” and guest “talent” were the saddest excuses for entertainment I’ve ever seen. I have seen low-budget high school productions with more value that what they showed at Carnival. Every time we asked questions at the front desk we were treated as a nuisance and patronized. What upset me most at the time, apart from the terrible service, was according to Carnival’s dry dock renovations schedules out ship was supposed to be completed with all additions and repairs. This clearly was not the case. I can’t imagine a company that promises luxury somehow feels it is acceptable and “luxurious” to have people travel on a vessel that is all but sea ready. Now, all of this alone merits a bad review, but as a non-confrontationalist I decided to leave well enough alone, but then I received a phone call today from Carnival that was possibly the most offensive and rude experience I may have ever had. I was called by a “Carnival Travel Agent” whom asked me if I enjoyed my cruise. He didn’t pause for answer before asking when I would book again. I was annoyed but politely told him that should I choose to do another cruise that it would not be with Carnival. Of course to which he inquired a reason. I was very upfront in telling him that I felt having a vessel in that state of renovation was inconvenient and that not alerting the passengers before hand was unprofessional. He seemed surprise that so much of this ship was closed and asked how I booked our trip because we should have been told. I told him we booked through Carnival’s website. He promptly replied, “oh, there’s your problem you booked through Carnival’s website and not through a Carnival Agent. If you had the Agent would have told you ahead of time, so it’s your fault.” WHAT? Not only did he tell me that their failure to tell their passengers about the abhorred state of disrepair that their ship was in was a result from booking through one specific facet of Carnival’s company, but it was my fault for not knowing any better and that I should have gone through a Carnival Travel Agent. This infuriates me for a number of reasons. I bought through Carnival, not a third party, Carnival. Buying through one of their “Agents” or their Website should make NO difference in how they treat their customers. They should also have the decency to tell their customers, if the ship will not be in complete working order. As a company that brings in as much money as they do, you would think that they would spend their earnings bettering their product instead of pocketing it all, leaving the customers with a lackluster experience. I honestly would like to know how much they make verses how much they put back into their company. And finally, not customer service representative (sorry I mean “Carnival Travel Agent”) should treat a customer so disrespectfully. I was offended, blamed, and humiliated by this employee and I find that, more than the poor condition of the ship, to be the most UNACCEPTABLE thing of all. To add insult to injury he kept trying to keep me on the phone only to keep telling me it was my fault. I wasn’t going to write a review, but you treat me inhumanely and you will get told what for. So here it is world, DON’T TRAVEL ON CARNIVAL. Don’t be dazzled by their low prices and hokey gimmicks. They are RUDE, DISRESPECTFUL, and TACTLESS company whom only seek selfish gains. ?#?CARNIVALISTHEWORST? THANK YOU FOR SHARING! We are looking into taking a family vacation, and most definitely take all reviews into consideration.